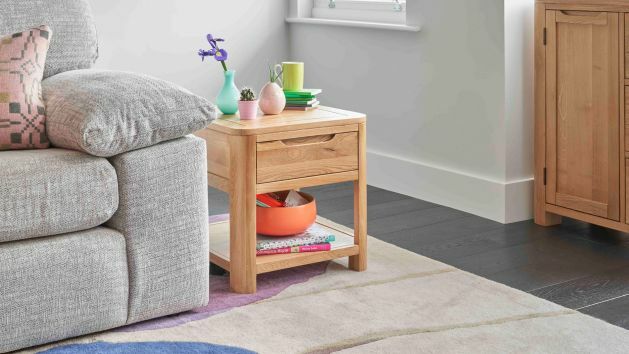 These beautiful solid oak occasional tables bring quality and good looks into your home. Made with our popular rustic and natural wax finishes in many styles. Small tables are versatile pieces for many rooms in your home. Whether you're looking for storage, display, or function, our wide range of solid hardwood pieces has something for everyone. These come in many forms, and are all made from the highest quality materials. We only ever use solid hardwood in our products. With real dovetail joints in each drawer, and specially selected hardware to complement the look of the tables, you can rest easy knowing they will last for years to come. We have a truly vast selection of stunning occasional tables to choose from, so you're guaranteed to find the perfect style to suit your home. These oak pieces are made in a variety of finishes; natural wax creates a bright look where the grain pattern really shines, rustic oak has a honey-coloured traditional charm, and other styles add their own individual look. Each of the small tables only uses solid oak throughout, including the bases, backs, and drawer runners. Drawers are also finished with high-quality dovetail joints for added durability. You'll find a stunning range of styles, from the nest of tables, to the console table, with end and side tables in between, perfect for creating flexible surfaces in your living room. Nest of tables are extremely versatile and useful throughout the home. Console tables are a great addition to your hallway, where they create an ideal place to store post, keys, and more. Our stunning side tables and end tables inject style no matter where you place them, in the guest room, home office, or living room. Shop our occasional tables today and enjoy free delivery to your room of choice.